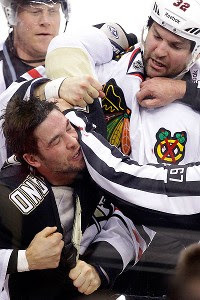 Last night, I dreamed that NHL disciplinarian Brendan Shanahan suspended Penguins defenseman, Deryk Engelland. For a couple of games. As he should. In the first period of the Pens thrilling 3-2 win over the Chicago Blackhawks last night, Engelland left his feet and drilled Chicago's Marcus Kruger with a high hit along the boards. I'm not sure if Eggo was targeting Kruger's head, but it doesn't matter what his intentions were. He aimed high and leaped into his check. Somehow the officials missed it. Kruger left the game and I haven't seen a report on his status this morning. If, as predicted by people much smarter than I, Shanahan hands Engelland a two game suspension for the hit, Eggo should take it and say, "Thank you, sir. May I have another?" Because NHL players need to learn to stop aiming high. Period. The sheer number of hockey players out with concussions or concussion-like-symptoms (what is the difference here?) is alarming. The effects of missing those players should have the powers that be in the league in full-on panic mode. Sidney Crosby, a/k/a the face of the NHL, is out again with concussion-like symptoms from an innocuous collision with linemate Chris Kunitz, just eight games into his glorious return to the ice. That all started when David Steckel, then of the Washington Caps, hit Sid in the head at the Winter Classic last year. Last year's rooking of the year, Jeff Skinner of the Carolina Hurricanes, was placed on IR with a concussion dating back to December 7th. The Ottawa Sens are without Milan Michalek. The L.A. Kings are missing Mike Richards. The Pens have two other players sitting with concussions: heir best offensive defenseman and power-play point-man Kris Letang has been out since taking a stick to the face in Montreal on November 26th; and defensive beast and penalty killing phenom Zbynek Michalek has been on the IR with a concussion, but has been cleared to practice very recently. That's just a small sampling of hockey players not on the ice due to head injuries -- the NHL reported that 25 players were out with concussions, allowing us a rare behind behind the cone of secrecy under which hockey operatives normally function. It's a freaking pandemic of debilitating closed-head injuries, people. Frankly, some concussions cannot be prevented. Clean hits can cause concussions. An innocent collision can cause a head-injury. Heck, there are always a handful of flukey accidents -- see Wayne Simmonds accidentally clipping teammate Claude Giroux in the back of the head with his knee. Doesn't get much flukier than that. But the rest of the head injuries can and should be eliminated. The league has a history of shameful inconsistency in meting out justice. You never know which NHL you're gonna get -- the one looking to eliminate cheap-shots and head-hunting, and the one that says that hockey is a tough guy sport and looks the other way. It's time for that to stop. They have to commit to eliminating unnecessary and dangerous hits to the head. Every single time one of them happens. They need to apply 'the high stick principal' to head-hunting. A player must be in control of his stick at all times. There's no gray area for that in the rules. There's no deviation. There's no room for sussing out a player's intent. Your stick goes up, you go to the box. Apply the same logic to head-hunting. You leap into a guy? You're out. [Suspending players for the kind of hit Engelland laid on Kruger last night would be a good start.] You put your elbow up? You're out. You clearly aim at a guy's head? You're gone. You want to hit somebody? Do it like Brooks Orpik -- shoulder to shoulder, chest to chest, hip to hip. This is a simply magnificent check on Alex Ovechkin. The league should send out tapes of this to every team in the league. It's a game guys. Regardless of our hyperbolic, militaristic jingo about it. It is not war and the point is not to maim your opponent. The NHL can view this as an opportunity to remind all of us -- players, coaches and fans alike -- of that. It may take a couple of seasons of discipline to do it, but eventually we'll all get the message.